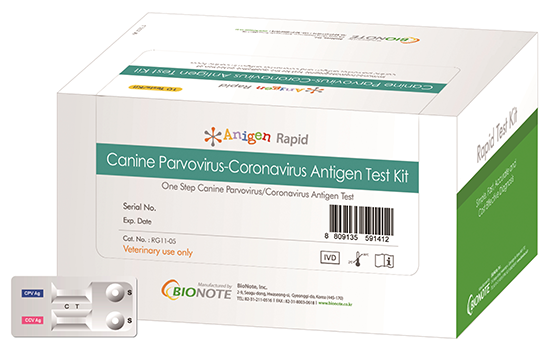 Principles: The Canine Parvovirus-Coronavirus Antigen Test Kit is a chromatographic immunoassay for the qualitative detection of Canine Parvovirus (CPV) antigen and Coronavirus (CCV) antigen in canine feces. Test performance: In large scale studies using several hundreds clinical samples, Canine Parvovirus-Coronavirus Antigen Test Kit was compared to PCR, a reference standard technique used by diagnostic labs, for detection of CPV and CCV antigens; the sensitivity and specificity were 100% for CPV antigen detection compared to PCR; the sensitivity was 93.1% and the specificity was 97.5% for CCV antigen detection compared to PCR. In a field trial study taking place at multiple veterinary clinics in the United-States, the sensitivity and specificity were 100% compared to PCR for CPV antigen detection.